Is China’s top wireless carrier ready to leave the penalty box? China Mobile (NYSE:CHL) is generally considered a conservative play on the Chinese market. However, shares of the country's top wireless carrier tumbled more than 30% over the past three years due to ongoing concerns about the saturation of the smartphone market, rising expenses, and trade tensions with the US. But are investors overreacting to those headwinds? Let's discuss the bear and bull cases to see if China Mobile is worth buying near its multi-year lows. China Mobile finished May with 901.9 million wireless subscribers, which represented 4.5% annual growth and 0.3% monthly growth. 671.8 million of those subscribers were on 4G plans, which represented 15.2% annual growth but just 0.4% monthly growth. China Mobile's 4G customer base shrank for the first time in April with a 0.4% month-over-month drop. That decline was caused by the saturation of China's 4G market, as well as competition from smaller peers China Unicom (NYSE:CHU) and China Telecom (NYSE:CHA). The bears argue that this slowdown will persist until the three telcos transition to 5G networks. Unfortunately, that transition also requires costly network upgrades, which could become pricier due to escalating trade tensions with the US. Many of China's 5G network upgrades still require American components; new tariffs would make much pricier, and new regulations could block sales of crucial parts. To spur customer growth, all three state-backed carriers eliminated their domestic roaming charges last October, and plan to cut their mobile data fees by up to 30% this year. They also introduced new plans for expanding free internet access in public places and reducing prices for broadband wireline services. Those moves, along with its ongoing network upgrades, could reduce China Mobile's near-term profit margins. China Mobile's wireless growth is slowing down, but its newer wireline business, which was launched in early 2016, is growing at a faster clip. It finished May with 130.4 million wireline subscribers, which represented 44.2% annual growth and 2.6% monthly growth. The growth of China Mobile's wireline business gives it more bundling opportunities, which could boost its revenues per customer while locking users into its ecosystem. It also connected 229 million Internet of Things (IoT) devices -- like connected cars, wearables, drones, and other gadgets -- to its network last year. The growth of these adjacent businesses could offset the sluggish growth of its wireless users. As for rising costs, China Mobile, China Unicom, and China Telecom all planned for the spike in 5G expenses by selling their towers to China Tower in late 2015. The telcos then took stakes in China Tower and leased back their towers to cut costs. China Mobile expects to lease fewer new towers this year, which will cause its leasing costs to rise just 8% -- compared to a 31% jump in 2017. China Mobile also isn't as dependent on American companies as the bears believe. One of its main 4G, 5G, and data center interconnect (DCI) partners is Finnish telecom equipment giant Nokia (NYSE:NOK), which is immune to trade tensions between the US and China. In April, Nokia announced that China Mobile ranked it first in a central bid to supply its regional optical transport network for 13 urban and two provincial backbone networks. China Mobile faces a wireless slowdown and margin pressures, but analysts still expect its revenue and earnings to rise 3% and 1%, respectively, this year. China Mobile also recently announced that it planned to repurchase up to 10% of its stock, which would further reduce its already low P/E ratio of 10. China Unicom and China Telecom, for comparison, have respective P/E ratios of 61 and 13. Lastly, China Mobile still pays a semi-annual dividend, which is adjusted every year based on a payout ratio of about 50%. 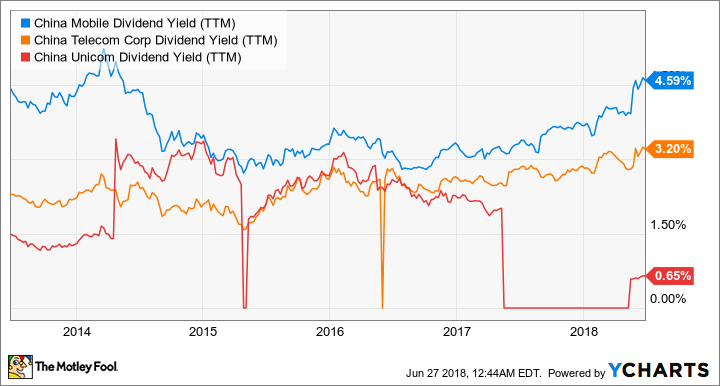 That yield fluctuates from year to year, but it's consistently remained higher than China Unicom and China Telecom's dividends. I personally own shares of China Mobile, and I've been disappointed in its recent performance. But I also think that it's oversold, and investors are overlooking some of its strengths. The stock will likely remain out of favor until trade tensions subside and customers start upgrading to 5G plans, but I think its valuation, buyback plans, and dividend should set a firm mid-$40s floor under the stock.